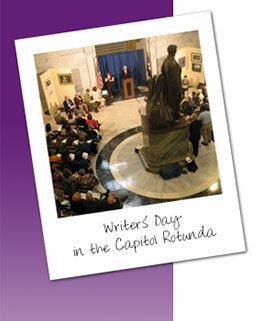 The Kentucky Arts Council presents Kentucky Writers’ Day on or around April 24 each year. Citizens devoted to the literary arts gather to hear readings by Kentucky’s current and former poets laureate. The Kentucky General Assembly established Kentucky Writers’ Day in 1990 to honor Kentucky’s strong literary tradition and to celebrate the anniversary of the birth of Kentucky native Robert Penn Warren, Robert Penn Warren was born on April 24, 1905, in Guthrie (Todd County), Kentucky. He attended Vanderbilt University, where he became the youngest member of the Fugitives, a group of Southern poets who advocated for rural agrarian traditions. Warren was a Rhodes Scholar, received the Pulitzer Prize for fiction for “All the King’s Men” and two Pulitzer Prizes for poetry, the first for “Promises: Poems, 1951-1956” (which also received the Sidney Hillman Award, the Edna St. Vincent Millay Memorial Award and the National Book Award) and the second for “Now and Then: Poems, 1976-1978.” Robert Penn Warren served as chancellor of The Academy of American Poets from 1972-1988, received a MacArthur Fellowship in 1981 and was named the first U.S. Poet Laureate Consultant in Poetry in 1986. He died September 15, 1989. the first poet laureate of the United States and winner of three Pulitzer prizes. In odd-numbered years, a new Kentucky Poet Laureate is inducted as a part of the Kentucky Writers’ Day ceremony. The Kentucky Arts Council encourages those interested in celebrating Kentucky Writers’ Day, but unable to attend the ceremony in Frankfort, to create their own event. Consult the Writers’ Day Planning Guide for ideas suitable for schools, colleges and universities, organizations, writing and reading groups, businesses, community centers and state and local agencies.